Raised Bowls Feeding Stations A Dangerous Option! 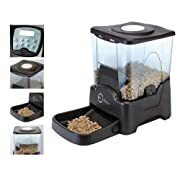 1 Raised bowls feeding stations look like a good idea, right? 4 Picking the Perfect Dog Bowl – what are your options? Raised bowls feeding stations look like a good idea, right? 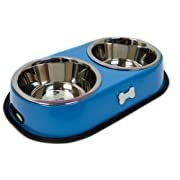 They keep your dogs bowls off the ground, they look cool and they can, hopefully keep the dog food and water in the bowls not spread all over your kitchen floor. 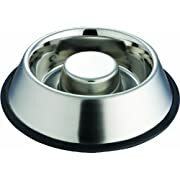 in reality raised bowls feeding stations are a dangerous option for your furry baby! Feed your dog several small meals, rather than one or two larger ones, throughout the day to avoid eating too much or too fast. If appropriate (check with your vet), include canned food in your dog’s diet. Maintain your dog’s appropriate weight. 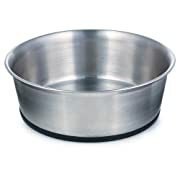 Avoid feeding your dog from a raised bowl unless advised to do so by your vet. Limit rigorous exercise before and after meals. Consider a prophylactic gastropexy surgery (which fixes the stomach in place, as described above) if you have a high-risk breed. All breeds can succumb to this deadly malady. So while it might be tempting to use raised bowls feeding stations – don’t! 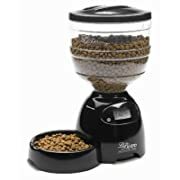 If you are looking for mess minimizing solution and thought that perhaps raised bowls feeding stations would solve that problem for you, maybe you should consider slow feeding dog bowls instead. 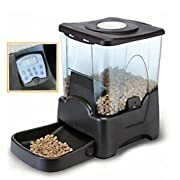 These dog feeders allow your pet to eat at the proper level and eat when they are hungry without you having to fill the bowls constantly or overfill them so that they have enough to eat all day long. 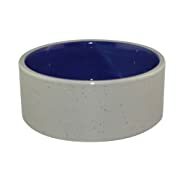 Make sure that the dog bowl is the right size to accommodate your dog’s feeding session. If the bowl is too big your dog could over eat and become fat. 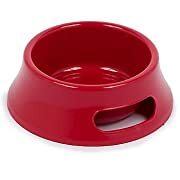 If your dog has floppy ears, your bowl for your dog’s food should be narrow enough to allow the nose and mouth in but not have the ears drop into the food too. Likewise if your dog has a short nose, like a pug or bulldog, your feeding bowls should be more shallow and wide to accommodate the breed features. Picking the Perfect Dog Bowl – what are your options? 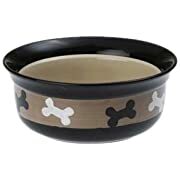 Plastic dog bowls – While these come in a variety of colors and sizes and are often the least expensive option plastic dog bowls might not be the best option for your pampered puppy. Dogs can develop allergies to the plastic causing rashes, irritation or even fur loss around the nose, and mouth. They are also easy to chew, making them more likely to end up dragged around the house and treated as a toy. They are also usually pretty light weight so when someone accidentally kicks it the food or water will end up all over the place. 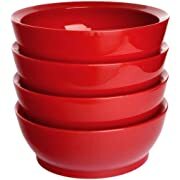 On the positive side, they are, as mentioned before, cheap, and dishwasher safe. 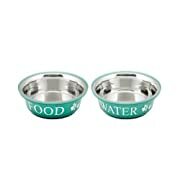 Stainless Steel Dog Bowls – Durable though not necessarily attractive, these bowls stand up to what ever your pet can throw at them. They are hypo allergenic, dishwasher safe, come in a variety of sizes (some with non skid on the bottom), are more heavy duty, thereby minimizing the likelihood of launching food or water everywhere and they are pretty inexpensive. 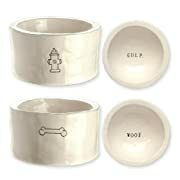 Ceramic Dog Bowls – These are a fun option and offer a variety of interesting designs allowing you to express your personal style. Most are dishwasher safe. If you choose this option, be sure to inspect these bowls often for cracks that can grow bacteria. 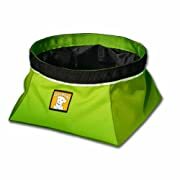 Travel Dog Bowls – Travel dog bowls are a great solution if you like to take your dog on trips to the park, hiking or even out of town. 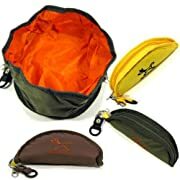 The nylon design makes them light weight and usually collapsible to the don’t take up much space. 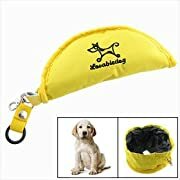 An inexpensive choice for your traveling pet. 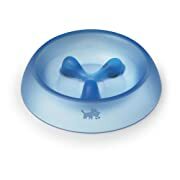 Raised Dog Bowls – We’ve already covered why these aren’t a good idea, however there are floor level “raised dog feeding bowl” holders. 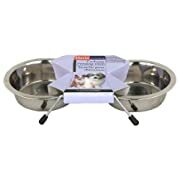 These are a great way to keep your dog dishes together in one spot while minimizing the danger to your dog a raised feeding station poses. 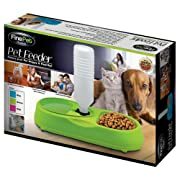 Slow Feeding Dog Bowls – Because these offer “on demand” feeding solutions, slow feeding dog bowls are a great option if you have to be away from your dog for extended period of time.